A series of injuries have blighted the Gameweek 23 team with enforced changes to be made. Two free transfers are beneficial given the long-term Harry Kane ankle injury. 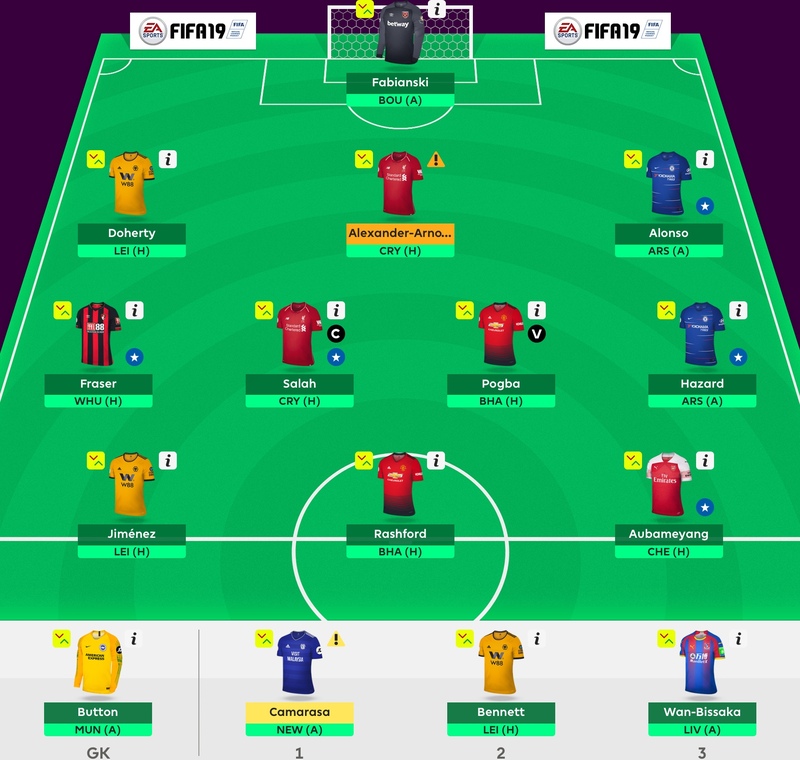 Here’s the shape of the Gameweek 23 team ahead of the deadline, with two free transfers and some spare cash in the bank. 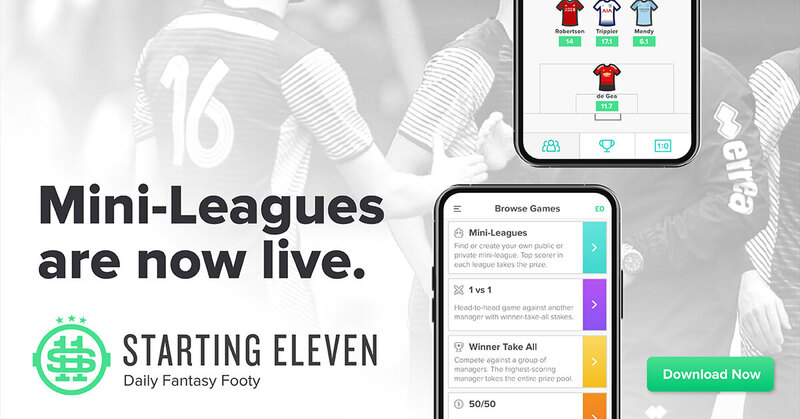 The team lies at 16k, with 1,373 points and a value of 103.9 million. The biggest priority was finding a replacement for the injured Harry Kane. 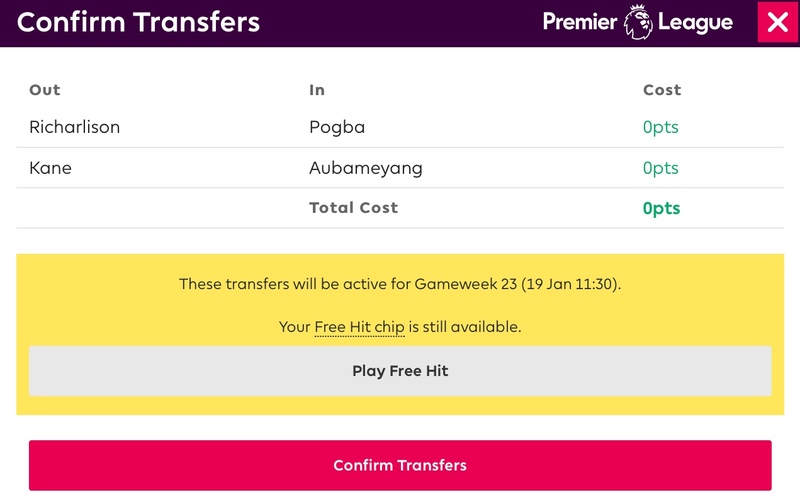 As a Rashford owner, the options were to move to another premium like Aguero, Aubameyang and Firmino or take the funds out of the front line to make upgrades in the midfield. A points hit was initially on the cards, particularly with the added complication of an injury to Trent Alexander-Arnold, but the prognosis from Liverpool’s press conference was positive, with him likely to return for Gameweek 24 at worst. Marcos Alonso is lacking form in defence, but has an excellent record against Arsenal and likely to benefit from the potential signing of Higuain as a target man. He may still be moved on in the coming weeks for a double up on Liverpool defenders. Richarlison has been frustrating in the midfield but does have excellent fixtures. Camarasa is another player who could miss out in Gameweek 23, but has been excellent value so far and with rotation limited this time of year, we’re happy to take the risk. The increased ownership of Marcus Rashford, due to Kane’s injury is frustrating, as he has proved to be an excellent differential in the squad over the last few weeks. With many managers now doubling or tripling up on United assets, given their form and fixtures, it got us thinking. Trent Alexander-Arnold became a hold on Friday afternoon, as his injury appeared to be less serious than first feared. He has a chance of featuring for the Gameweek 23 team. 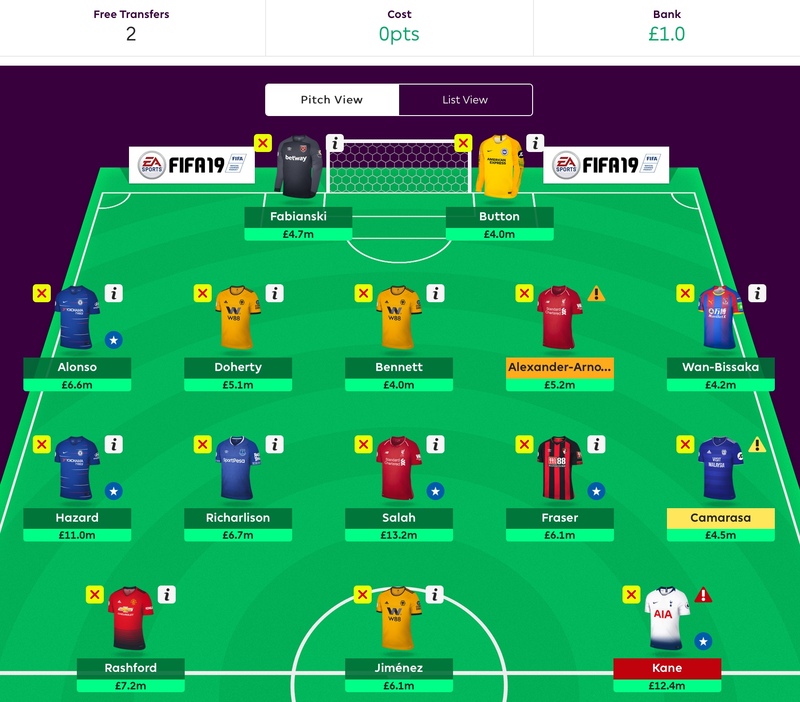 It was decided to stick with a 3-4-3 formation, with Kane swapping to one of Aguero, Aubameyang or Firmino. Aguero was ruled out as he remains a big rotation risk, with Gabriel Jesus in form. Firmino seemed the more tempting pick, given Aubameyang has the tougher short-term fixtures. However, there seems better value in a defensive Liverpool double-up compared to an attacking one, with Firmino playing reverse out of position, as a midfielder. Aubameyang is leading the golden boot race and now seems like the perfect opportunity to jump back on board, with two home games up next. 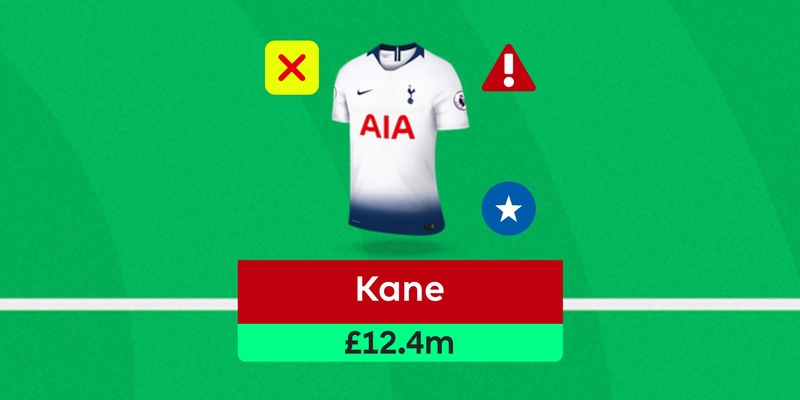 Looking at ownership, the spare funds from downgrading Kane, seemed too tempting to be left in the bank. We’ve lost patience with Richarlison: he has good fixtures, but ultimately Pogba has equally good fixtures, excellent form and in a much more exciting attack. He get’s out second free transfer. Here’s how the Gameweek 23 Team lines up. Trent Alexander-Arnold is on the pitch, in case he starts, although we would be surprised to see him in the starting 11. Bennett lies on the bench ready to step in if needed. Marcos Alonso plays in a tough away fixture to Arsenal, but he has a good record against the Gunners and the Chelsea defence will be difficult to beat. Camarasa and/or Wan-Bissaka remain as further bench cover if required. It was an easy captaincy decision this week: Mo Salah has an excellent home record against top 6 sides, he is the top scorer in the league and in FPL, plus he’s on penalties. Crystal Palace also have a goalkeeper crisis, with the ageing Julian Speroni needing to step in with Guaita and Hennessey both injured.